Commission Tales: Elmo says,"Tee hee, that tickles! "…or something. Pulled myself through a bad case of the flu in order to complete this cake commission last week. One of two commissions, actually. Ah well, illness never arrives in the right time anyway, so we must soldier on regardless! Of course, I made scrupulously sure that all of my baking surfaces were cleaned and disinfected, and that I was appropriately masked and aproned, not to mention I washed my hands frequently. I figured that, after five days of illness, I was no longer contagious, so most of these precautions were a bit paranoid and over the top…but I don’t take chances with other people’s health, especially when I make a cake for a child. In any case, my commission was for a delightful little girl who was turning one year old. Being a big fan of Sesame Street Elmo, it only made sense that her birthday cake would feature the giggling, furry creature. Working on an inspiration picture gleaned from the internet, this cake was a delightful vanilla-lemon funfetti five-layer round cake, with vanilla lemon buttercream and homemade raspberry jam filling between each layer, vanilla lemon buttercream frosting in that characteristic Sesame Street bright yellow, and Elmo’s face piped in bright red buttercream on the top with “Happy birthday” greetings surrounding it. 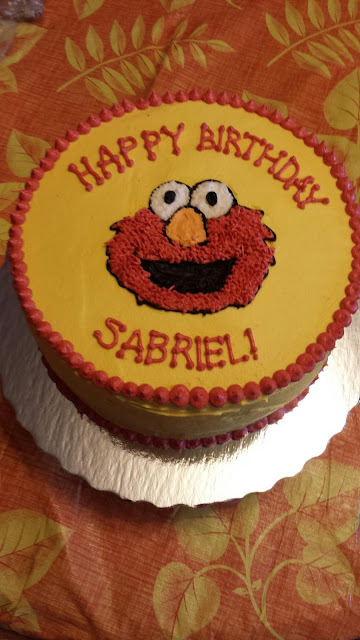 I had originally attempted to pipe the Elmo character using the “pinhole” technique, where you cut out a simplified picture of your intended design and place it on your cake, then use a sharp pin to delineate the outline that you then pipe over with frosting. This technique works very well on fondant-covered cakes, but the buttercream came to temp too quickly to be effective. So, I just hand-drew it from the reference picture.